The Book of Cheese is the first book of its kind to be organized not by country, milk type, or any other technical classification. 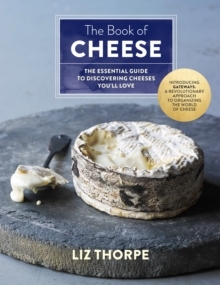 Instead, it maps the world of cheese using nine familiar favourites, what author Liz Thorpe calls the Gateway Cheeses. Liz takes readers on a journey from basics like Swiss, Blue, and Cheddar, to explore more adventurous types. For example, if you love Brie, Liz shows you how to find other Brie-like cheeses, from the mild Moses Sleeper to the pungent Fromage de Meaux. Liz's revolutionary approach allows food lovers to focus on what they care about: finding more cheeses to enjoy. Also included is the best information you'll ever find on pairings, storage, cooking with cheese, and cheese plates. Illustrated throughout with gorgeous photography, The Book of Cheese will quickly become not only your favourite book on this mouthwatering food but the only book on cheese you will ever need.